The Commerce Department's National Institute of Standards and Technology (NIST) today awarded 19 advanced manufacturing technology planning grants totaling $9 million to new or existing industry-driven consortia to develop technology roadmaps aimed at strengthening U.S. manufacturing and innovation performance across industries. 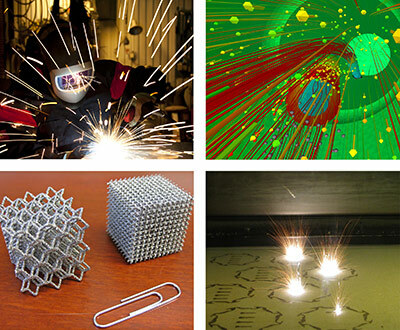 The grants, awarded to universities and other nonprofit organizations, are the first conferred by NIST's new Advanced Manufacturing Technology Consortia (AMTech)Program. They range from $378,900 to $540,000 for a period of up to two years. The funded projects will identify and rank research and development goals, define workforce needs, and initiate other steps toward speeding technology development and transfer and improving manufacturing capabilities. Project collaborations span a wide variety of industries and technologies, from flexible-electronics manufacturing to biomanufacturing and from pulp-and-paper manufacturing to forming and joining technologies. "The AMTech awards provide incentives for partnerships to tackle the important jobs of planning, setting strategic manufacturing technology goals, and developing a shared vision of how to work collaboratively to get there," said NIST Director Patrick Gallagher. "These are essential first steps toward building the research infrastructure necessary to sustain a healthy, innovative advanced manufacturing sector—one that invents, demonstrates, prototypes and produces here, in the U.S."
Technology roadmapping is a key component of all funded projects. Each consortium will engage manufacturers of all sizes, university researchers, trade associations and other stakeholders in an interactive process to identify and prioritize research projects that reduce shared barriers to the growth of advanced manufacturing in the United States. Protecting our nation’s valuable information assets from hackers and other threats is often dependent on better collaborations—both public-private partnerships and state, local, and federal efforts. 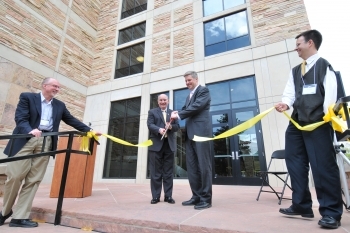 NIST’s National Cybersecurity Center of Excellence is all about such partnerships. And that’s why I was honored to join U.S. Senator Barbara Mikulski (Md. ), Maryland Governor Martin O’Malley, Montgomery County Maryland Executive Isiah Leggett and Maryland’s Secretary of Economic Development Dominick Murray Tuesday to celebrate a new agreement that extends public collaboration on this important topic. These same organizations joined me in Feb. 2012 to launch the center’s efforts to address various industries’ cybersecurity challenges and to accelerate the adoption of technologies that are based on standards and best practices. 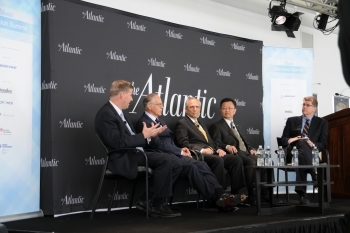 Since that time, the center has been bringing together experts from industry, government and academia to demonstrate integrated cybersecurity that is cost-effective, repeatable and scalable. Eighteen IT industry leaders have joined our efforts through the National Cybersecurity Partnership initiative. Additional companies—both large and small—have worked with us on specific projects focused on health IT, energy, and financial services, with more to come, including efforts to support the recently released Framework for Improving Critical Infrastructure Cybersecurity. 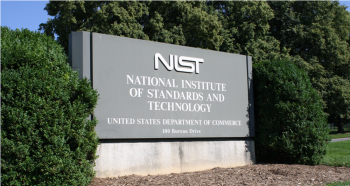 The agreement signed by NIST, Maryland and Montgomery County provides the center a new home with an expanded footprint, both physical and programmatic, not far from NIST’s Gaithersburg, Md., campus. It encourages technology transfer of government-developed technologies to companies for licensing and from one government agency to another. This collaboration also will help the state and county departments of economic development support new security technology companies and products, as well as to identify future workforce needs and provide opportunities for high school, college and graduate students. Doubling automobile fuel economy by 2025. Reducing the weight of automobiles by up to half a ton each while maintaining or improving safety. Saving millions of dollars annually in redesign and re-tooling costs. These are some of the ambitious auto industry goals supported by the Center for Automotive Lightweighting at the National Institute of Standards and Technology (NIST). Yesterday we were honored to host a visit by U.S. Senator Barbara Mikulski (D-Md.) to the lightweighting center. As chairwoman of the Senate Appropriations Committee, Mikulski came to the NIST campus in Gaithersburg, Md., as part of her continuing “Jobs Tour” in the state. 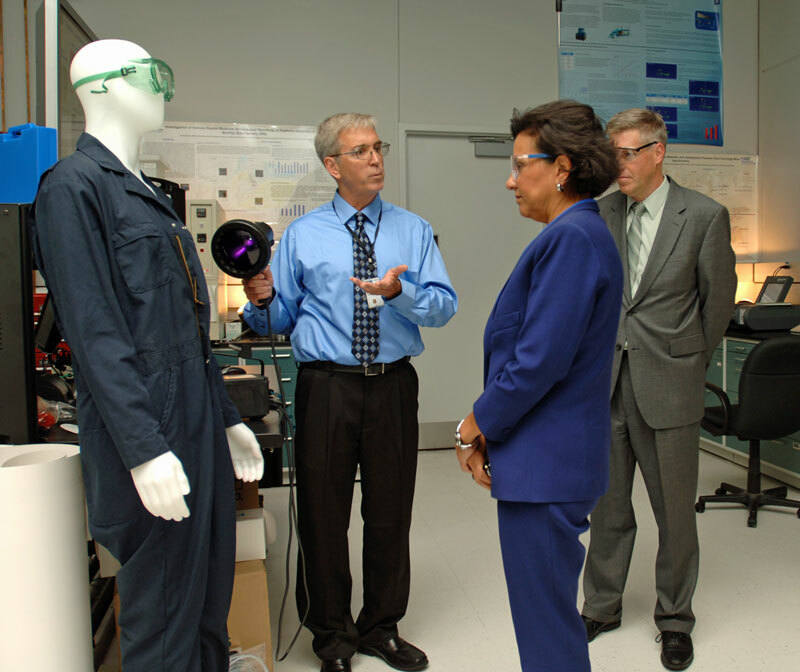 She also gave a talk to NIST staff about the recently enacted Consolidated Appropriations Act of 2014. The act provides $850 million in appropriations for NIST work through October 2014. Included is a $30 million increase in funding for advanced manufacturing research. Such research provides manufacturers with the data and measurement tools and technologies they need to continually improve their products and compete in the global marketplace. Established in 2006, the lightweighting center helps the auto industry stay competitive by developing new measurement methods and collecting critical data on the properties of lighter weight automotive alloys and composites. 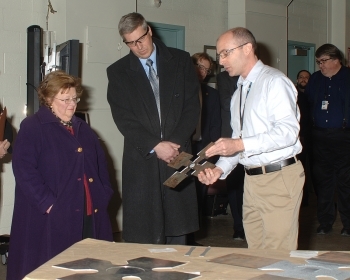 During the tour, Senator Mikulski was shown samples of new high-strength steels and aluminum and magnesium alloys that weigh up to 65 percent less and yet are stronger than the traditional mild steels that have been used in vehicles for the past 100 years. NIST-developed research instruments installed at the center twist, press, stretch and squeeze the new lightweight materials to better understand how they will perform when shaped into automotive parts, including predicting safety during crash tests. The resulting data and analysis of the materials behavior help companies reduce expensive trial and error testing. 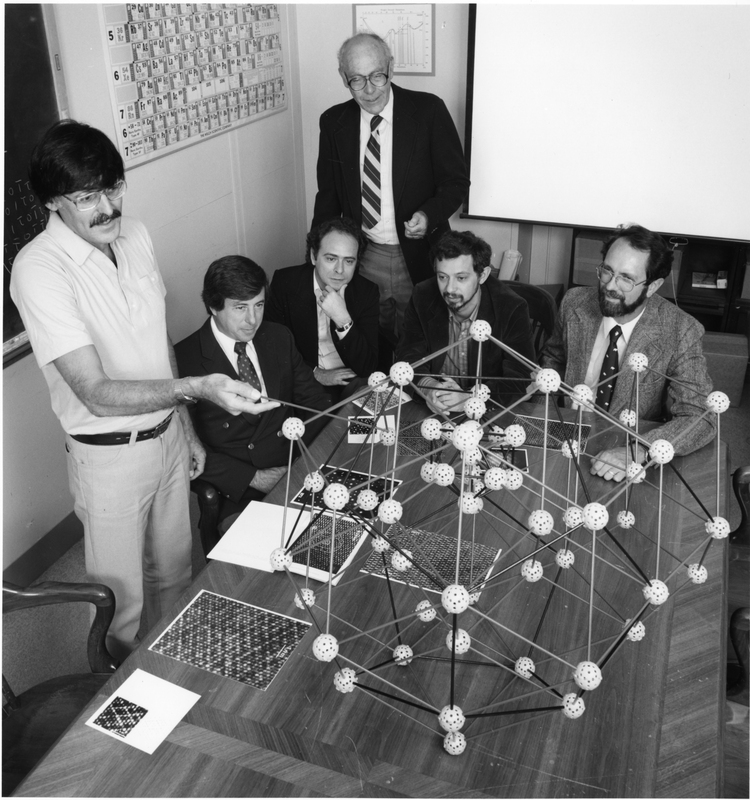 By sharing fundamental materials properties data like this, the NIST center allows individual manufacturers to use more of their own scarce research dollars to leapfrog to better company-specific solutions and improved products. More than 30 companies and research universities, including five automakers, have expressed interest in a new NIST Automotive Lightweighting Consortium now being formed. The Commerce Department's National Institute of Standards and Technology (NIST) announced today that more than $2.3 million in funding for Phase I and Phase II Small Business Innovation Research (SBIR) projects will be awarded to 13 U.S. small businesses. The awards provide funding to help develop manufacturing and cybersecurity technologies that could lead to commercial and public benefit. "We congratulate the companies selected out of the numerous high-quality proposals we received," said Under Secretary of Commerce for Standards and Technology and NIST Director Patrick Gallagher. "The SBIR program provides a great way to foster technological innovation at small businesses and help keep America innovative and competitive." NIST's SBIR program seeks to stimulate technological innovation in the private sector, especially at minority and disadvantaged firms, strengthen the role of small business in meeting federal research and development needs and increase commercialization of federal research and development. SBIR awards are funded through a competitive, three-phase process. In Phase I, small businesses can receive up to $90,000 to establish the technical merit, feasibility and commercial potential of the proposed research and development. Phase I awardees compete for Phase II funding of up to $300,000, enabling them to continue their efforts. Phase III involves commercial applications of the newly developed technologies, with funding from outside the SBIR program. Just about everything these days—from banking to health care to the electricity powering our homes—is rooted in cyberspace. This any time, any where interconnected world unfortunately brings with it a constantly evolving set of security challenges. That’s why President Obama directed the National Institute of Standards and Technology (NIST) to work with industry on a voluntary cybersecurity framework for better protecting the nation’s critical infrastructure. The idea is to use existing standards, guidelines and best practices to reduce cyber risk across sectors and develop capabilities to address the full-range of quickly changing threats. The framework will provide a flexible toolkit any business or other organization can use to gauge how well prepared it is to manage cyber risks and what can be done to strengthen its defenses. It is vital that companies understand their digital assets and accurately assess the maturity of their cyber protections so they can properly allocate resources. These needs stretch across a spectrum from maintaining awareness of existing threats to preventing, detecting, and responding to attacks to recovering from them. Under Secretary of Commerce for Standards and Technology and National Institute of Standards and Technology Director Patrick Gallagher today addressed a group of forensics experts at the American Academy of Forensic Science’s annual meeting in Washington, D.C.
Gallagher was there with Elana Tyrangiel, acting assistant attorney general for the Office of Legal Policy at the Department of Justice, to explain each agency’s role in a new National Commission on Forensic Science, announced Friday, Feb. 15. 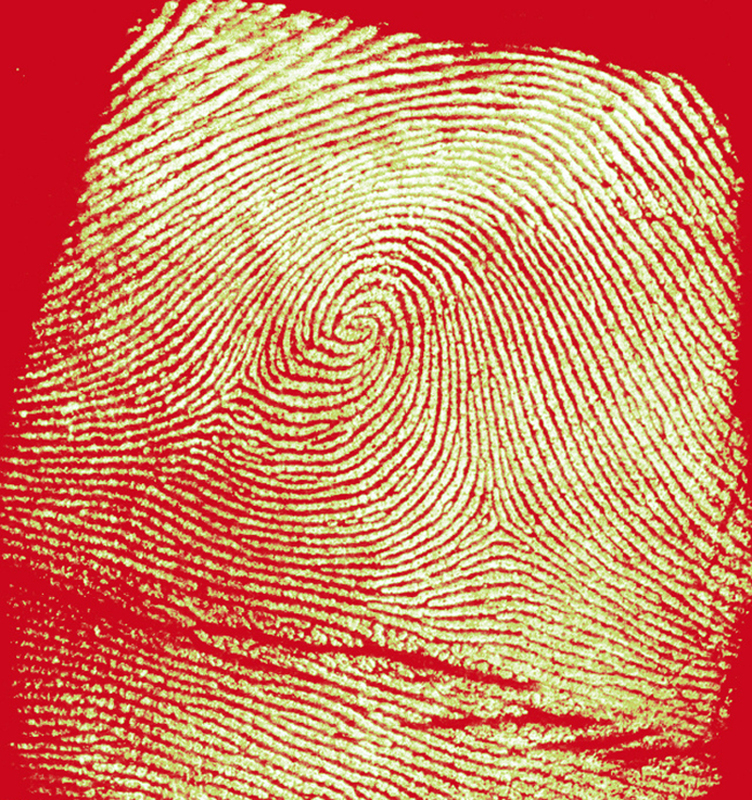 The National Commission on Forensic Science will be composed of approximately 30 members, bringing together forensic science service practitioners, academic researchers, prosecutors, defense attorneys, judges and other relevant stakeholders to develop policy recommendations for the Attorney General. 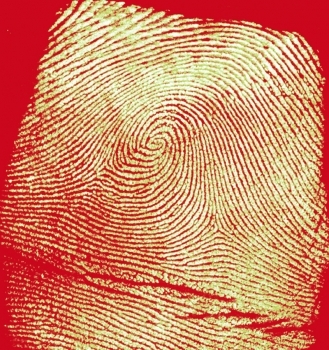 The commission will consider guidance on practices for federal, state and local forensic science laboratories developed by groups of forensic science practitioners and academic researchers administered by NIST. On Tuesday this week, Under Secretary of Commerce for Standards and Technology and Director of the National Institute of Standards and Technology (NIST) Patrick Gallagher was in Chicago to visit two manufacturing companies to learn more about the best practices and challenges confronting U.S. manufacturers. “Having the opportunity to hear directly from manufacturers and see their operations firsthand is invaluable to those of us working to support and increase the competitiveness of American manufacturing,” said Gallagher. Gallagher, along with representatives from the City of Chicago including Housing and Economic Development Commissioner Andrew Mooney, toured PortionPac Corporation. The company is a sustainability-focused manufacturer of highly concentrated, pre-measured cleaning products. President Burt Klein and other company leaders got the chance to showcase their manufacturing processes. With its commitment to workforce excellence, recognized by INC. magazine’s 2010 Winning Workplace, and its values of innovation, environmental leadership and social responsibility, the company highlights the keys to success for the next generation manufacturer. Is a growing source of good jobs. What we don’t hear about as often are specific cases where U.S. manufacturers are using new technologies to diversify their markets, improve their products, and create or retain jobs. I was fortunate today to visit one such company, Omega Plastics Inc., located in Clinton Township, MI, about an hour outside Detroit. 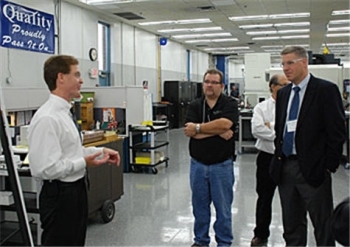 The event was part of a “Best Practice Tour” sponsored by the Michigan Manufacturing Technology Center (MMTC), an affiliate of NIST’s Manufacturing Extension Partnership (MEP). That is why the $26 million Advanced Manufacturing Jobs and Innovation Accelerator Challenge, supported by 14 Federal agencies and announced today by the Obama administration, is so important. The Advanced Manufacturing Jobs Accelerator is a competition to help grow industry clusters by strengthening connections to regional economic development opportunities; enhance a region’s capacity to create high-quality sustainable jobs; develop a skilled advanced manufacturing workforce; encourage the development of small businesses; and accelerate technological innovation. At the Department of Commerce, the National Institute of Standards and Technology (NIST) and the Economic Development Administration (EDA) are leveraging resources, along with the Departments of Energy and Labor, the Small Business Administration (SBA), and the National Science Foundation, to support public-private partnerships to spur economic and job growth in manufacturing clusters. Approximately 12 projects are expected to be chosen. This is the third in a series of multiagency Jobs and Innovation Accelerator challenges since 2011. Winners of the 2011 challenge, which was funded by EDA, the Department of Labor’s Employment and Training Administration, and the SBA, have already begun to foster business growth and create jobs. For example, in the Greater Kansas City area, eight regional organizations joined together to form the Kansas City Jobs Accelerator. This organization is helping the advanced manufacturing and information technology cluster in the bi-state region by identifying game-changing technologies and processes and putting them in the hands of small businesses and talented entrepreneurs. Their tactics include coordinating research resources, helping prepare workers for careers in advanced manufacturing, and creating a clearinghouse for regional cluster and commercialization information. Standards—agreed upon parameters such as the size and shape of electrical outlets, the number of threads per inch on machine bolts, or the tolerances allowed for various medical tests—are critical to American competitiveness, technological innovation, and global trade because they facilitate manufacturing, speed delivery, and enable the widespread use of countless products and services in the market today. Standards also play a key role in public safety, as a new report (PDF) makes clear. Most standards are developed and adopted by industry, but in cases where we face national challenges, the Federal Government can help accelerate the process. 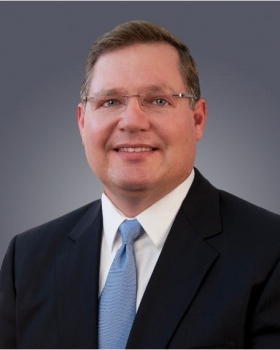 The Commerce Department’s National Institute of Standards and Technology (NIST) today announced the appointment of the agency’s first-ever Chief Manufacturing Officer. The manufacturing sector is critical to the U.S. economy, and the Obama administration is committed to building domestic manufacturing capabilities to create the new products, new industries and new jobs of the future. The new position will leverage NIST’s strong relationships with industry to accelerate innovation that will create 21st-century manufacturing jobs and enhance our global competitiveness. As Chief Manufacturing Officer, manufacturing industry executive Michael F. Molnar will be responsible for planning and coordination of the Institute’s broad array of manufacturing research and services programs and will support the broader Advanced Manufacturing Partnership recently launched by President Obama that brings industry, universities and the federal government together to invest in emerging technologies. 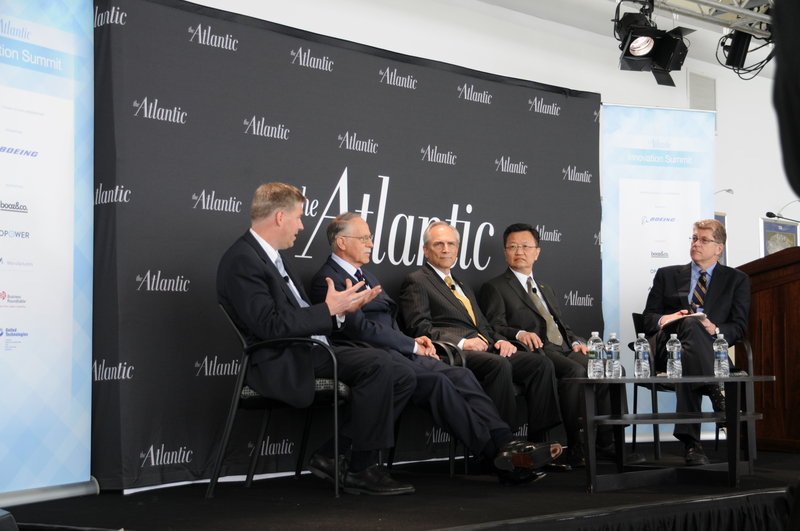 NIST is particularly well-positioned to support this goal because of its unique mission to work closely with industry. 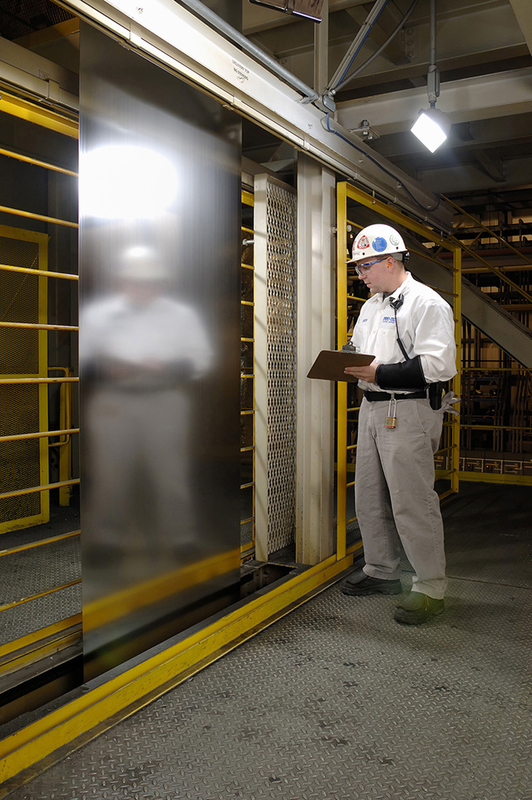 Molnar has extensive industrial experience, with past leadership roles in manufacturing technology, advanced manufacturing engineering, metrology and quality systems. He will serve as the central point of contact with the White House, the Department of Commerce and other agencies on technical and policy issues related to manufacturing.